Ah, what a wonderful week of vacation I have had. Sadly it all goes by too quickly. There was a lot of time in the garden and a lot of time on my bike and a lot of time reading books and magazines and online articles. I could use another week. Or two! In the garden my new favorite green is sorrel. It is a perennial green and I have the tame French variety growing in my herb spiral where it stays compact and tidy. But last year when we dug a place for Amy Pond and discovered just how sandy our soil is and piled all that sand up not far from the pond intending to do something with it and never quite figuring out what, a common garden sorrel planted itself there. I have no idea where it came from, seed dropped by a bird or raccoon or maybe it was already there and grew up through the pile of sand. Regardless, we decided to let it stay. 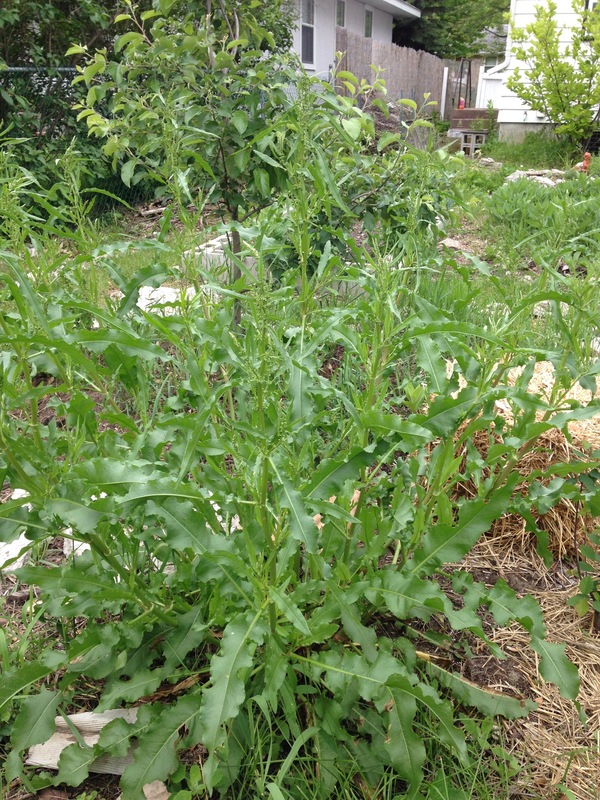 It grew all summer last year and got taller than the French sorrel but generally behaved itself. In spring it was one of the first green things sprouting in the garden. We used it’s leaves on sandwiches as a lettuce substitute. of a plant, tall and sprawling. It got so large I began to doubt our decision to let it grow. But then I found a recipe for sorrel pesto. Bookman made it and we had it on buckwheat soba noodles. It was divine! It had kick. And because we have so much of the stuff there are plenty of leaves for more! I have cut the plant back a little and we have frozen some of the leaves to use later. I hope it keeps growing all summer because I am imagining freezing sorrel pesto to have in the middle of winter. Yum! We have been eating strawberries from the garden nearly every day for the last two weeks. They are slowly winding down, fewer and fewer each day and smaller than the early ones. The raspberries are beginning to color up a bit though so perhaps in a couple weeks we will have some ready to eat. Which reminds me, I had better put netting over them now or I might never get to have any! Yesterday evening I pulled the first two radishes out of the garden. Oh radishes, how I love them! These are pink ones, I can’t remember the variety, sorry. But they are mild with just the right amount of crunch and kick to really enjoy sliced up in a salad. I’m hoping the next ones I pull will get sliced up onto a sandwich. I am going to try planting more radishes in some bare places in hopes that I can have radishes all summer long. I usually just do one planting and when they are done I am sad. But radishes grow so fast I should in theory be able to plant them until the middle to end of July. We’ll see if it works. The peas are looking great and have been blooming all week. How long from flower to edible peas? One week? Two? I have never paid any attention. But I love peas so much and my mouth is watering in anticipation that I will be paying close attention this time. I have also planted twice as many peas as I have in the past in hopes of having an abundance that lasts longer than a couple weeks. I am greedy. Fingers crossed! What caused the glass to shatter? There was a mystery that happened during the week. Late morning, I am indoors reading with the sliding door to the deck open to let in the breeze. All of a sudden I hear a crash. Bookman sometimes leaves baking pans precariously perched on the counter and even though he hadn’t been baking anything I couldn’t think what else it could be. I got up to check and discovered everything in the kitchen was fine. But Waldo was puffed up and staring out at the deck. 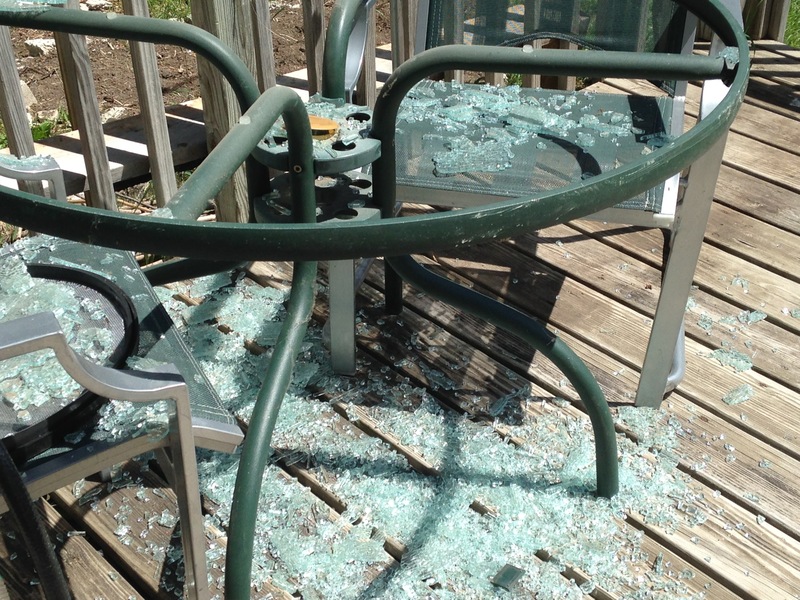 I look out and to my great surprise, the glass in the outdoor table had completely shattered. There was no evidence of what could have caused it. No rocks or dangling icicles. No meteorites. Nearest we can figure is that maybe there was a crack in it we didn’t know about and a squirrel jumped on it and got a big surprise. But we can only speculate. The garage was supposed to get knocked down Thursday last week but due to a communication mishap it got pushed to Friday. But Friday the contractor called and said a piece of his equipment he needed broke and it has been rescheduled for Monday. However the weather forecast for Monday morning is thunderstorms. Will it be put off yet another day? Stay tuned. I was able to get in a few great bike rides during the week. Friday I did the 55-mile/88.5 km loop I had done the week before. It is a good ride, perfect distance with a variety of terrain. Well, part of the ride is on a gravel trail and at the end of the trail by Lake Riley when I was turning off of it onto pavement, my back wheel slipped right out from under me and down I went. It happened so fast I didn’t know it until I found myself on the ground. A nice man walking by came over to check on me and make sure I was ok. I had scarped up my left thigh, my right calf and lost some skin on the palm of my right hand. I had a trail of blood creeping down each of my legs, but while it looked bad, I didn’t feel hurt, just a bit shaken up. Astrid took a wound too. 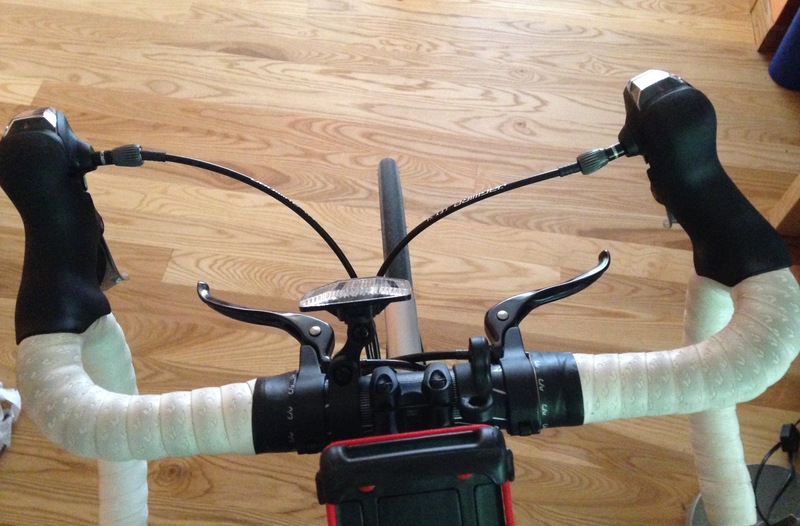 The gear/brake mount thingy on the right handlebar was bent but not too badly and everything was still working ok. So I took a few minute’s breather, had some water, made sure Astrid and I really were okay, determined that we were and off we went to finish the ride. I had nothing to wipe the blood off so just went with it. And when I got to the hilly segment of my ride I was feeling great. When I got home I discovered feeling great was not an illusion. My hilly stretch is a Strava segment and I had been awarded Queen of the Mountain, meaning I have the best time over that segment than any other woman on Strava. Woo! And that after wiping out. Do you know what that means? Astrid and I are badass! I also completed the ride five minutes faster than the first time I rode it. Badass! And it turns out I did not have to take Astrid in for repairs, Bookman was able to move the gear/brake mount thing back into alignment. I am not happy about having to go back to work tomorrow but at least I will be able to show off my battle wounds. That’s worth something. Oh no! Did we forget to suggest you wear bike gloves? Congratulations on you & Astrid being badasses!! glad to hear you both survived. Sounds like you had a wonderful staycation albeit to short! Helen, about those gloves, I have some and generally wear them but was 20 minutes down the road at the beginning of my ride and realized I had forgotten them and decided not to turn around. I’ll be fine, I thought, what could possible go wrong? Heh. I am a cautious rider and terrified of falling but my little spill has taught me I am a bit hardier than I suspected. Not that I am now going to go wild, but the what if anxiety over falling is not as bad as it used to be. It was a wonderful vacation and no matter how long they are they are always too short! I love hearing about your vacation! May I suggest you freeze some sorrel to try it in a soup (if it’s too sour, you should do it half and half with spinach)? I hope the attack by the invisible man on your garden table was just a one off. Congratulations on being Queen of the mountain! smithereens, sorrel in soup? Hadn’t thought of that! Thanks for the suggestion! The table shattering was the weirdest thing. Where is Sherlock Holmes when you need him? And thanks! No doubt I won’t be QoM for long, but even for a little while it is kind of cool. 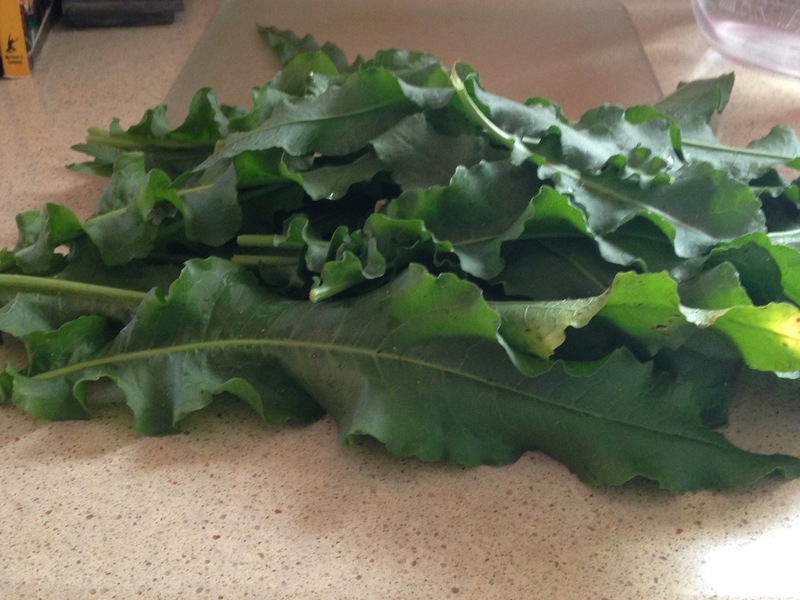 Grad, yep, that’s sorrel, kind of like huge dandelion leaves without the edges and no yellow flowers. It probably is sorrel in your back lawn. There are lots of photos on the internet to help you identify it for sure. Too bad about the beans. At least you did get some and they were tasty. Having a fall with Astrid was bound to happen sooner or later, I’m glad we are both ok and it happened in a quiet area and not on a busy street in traffic. My doctoral supervisor always used to say that you should never take one week’s vacation if you can possibly stretch it to two because you are only just beginning to wind down at the end of the first week and need the second to get the benefit out of the rest. I think you should remember that in your planning next year but for this year could you not justify a second week on the grounds that you need to recuperate from your fall? The Bears are very worried about you and would willing write you a sick note for your boss. Whoa! Your table! That’s crazy. I’m glad nobody was injured when the glass shattered. That happened to my car window once before, but we’re pretty sure it was from a pebble that a lawnmower across the street threw up. Jenny, I know it is so weird. Yes, thankfully no one was around when it happened, that was a lot of glass. A pebble from across the street broke your car window once? That is pretty strange and random too. At least you were able to figure it out! Love the sound of your sorrel, boo hoo re your table and tumble though. Still, you and Astrid are clearly badass. I wouldn’t want to come across you two in a dark alley on a dark night. Anyhow, sounds like you had a profitable vacation or, as we Aussies call it, holiday. Yes, we do have sorrel here. I think there are different plants named sorrel though, here. The French variety is the one we eat … so we do see it occasionally in restaurants. But some are weeds too. But what shattered the glass in the table? I cannot leave a mystery of such magnitude alone. Did you see any shell-shocked squirrels shivering on tree branches? If only you could interview Waldo! Silent witness indeed. I hope he is under a protection scheme now. Or maybe you have a garden poltergeist??? I am so glad you had a lovely week – I’d gift you another if I could! Maybe whatever it is that comes and eats your garden jumped on the table and broke it–and was mighty surprised–so it is divine justice? 😉 Sounds like a great break–but I know how it never actually feels like enough! I am envious of your garden (though not of all the work you put into it…..)–how nice to be able to have a treat from it every day!